Being a lover of seafood I like to make it at home, especially it being so easy and effortless to make. I’m always on the lookout for it comming on special, I stock up and have it in the freezer for when the mood strikes. Sometimes I like to combine different seafood in one recipe, like this one. Well actually I’m trying to use up some crab and shrimp I have on hand. 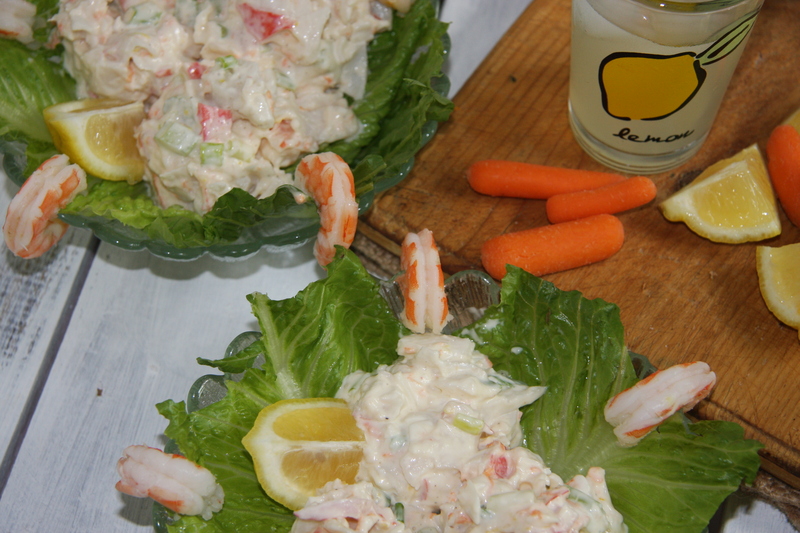 When trying to think up a recipe, it came to me to throw crab and shrimp together in a mayo. That way I could accomplish one thing. To get the Mayor of the household to eat some seafood. Oh, he’ll eat it on occasion but put mayo in it and he’ll eat it everyday. Mission accomplished. So this is what I came up with. Really not hard to do. I just put in what I do for egg salad minus the eggs. The Mayor loves egg salad, so I know I have a winner. Chop 1 1/2 lbs. of imitation crab along with 1/2 lb. 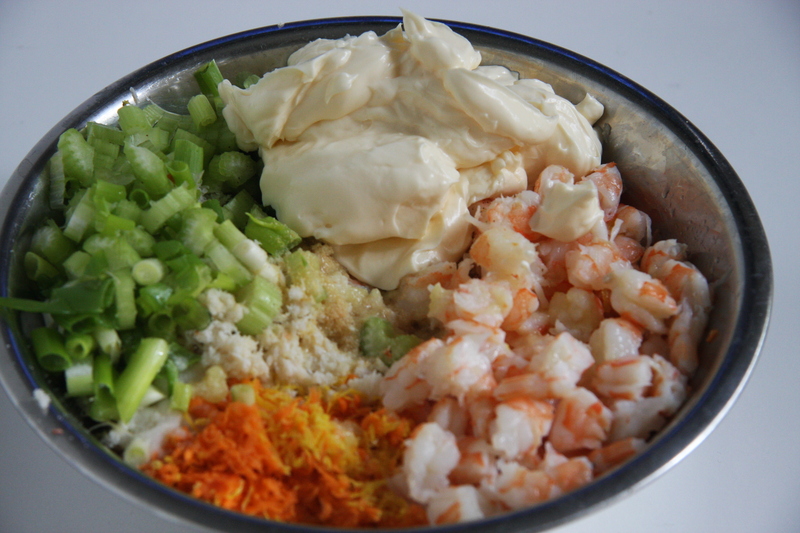 of cooked shrimp, 1 can crab meat, 3-4 stalks of green onions, 3 stalks of celery and about 1/4-1/2 shredded carrot. Place into a large bowl. Next grate the rind of 1 lemon then add the rind and the juice to the seafood bowl along with 1 teaspoon of granulated garlic and 1 to 1-1/2 cups of mayo. Salt and pepper to taste. Mix well and refrigerate for a couple of hours. Don’t be afraid to add or omit ingredients. Put in things and the amount of things that you like. I add a bit more mayo for instance. Or I add more ingredients so the dish will last longer, feed a bigger crowd, or that my son and his wife can take home leftovers. I always cook with the assumption why make a mess twice, just make more. It has worked well for me over the years. Serve with fresh buns, toasted bread rubbed with garlic or crackers. Hope you enjoy it. It is really tasty. Mix all the ingredients together. Refrigerate 2 hours or overnight. Serve in a bowl along with buns or toasted garlic rubbed crostini, crackers, even and edible salad bowl, wrapping the shrimp and lobster salad in lettuce. You can really use anything you like. Great as an appetizer or a meal along with a salad. LOVE SEA FOOD. READY FOR IT ANY TIME. I know I love seafood too. Have a great day. What a yummy recipe Baba! I don’t know about the mayor but you certainly have won me over with this yummy treat. Pinning and sharing. Baba I just want to let you know that we will be featuring your yummy recipe on Friday at the Sweet Inspiration Link Party. See you then. WOW Thank you Mary, I am honored. It is a privilege to be honored on your blogs link party Sweet Inspiration. Thank you. Thank you for the lovely comment. Also for featuring my recipe on Sweet Inspiration Link Party #18. I am honoured and humbled to be featured on your blog and link party. Fantastic, I`m so glad you tried it. It`s always a hit. Thank you for sharing.